With climate change in the Arctic, temperatures are expected to rise at twice the global rate. This rapid change has the potential to disrupt local ecosystems and generate climate feedbacks as carbon now stored in frozen soils is converted to carbon dioxide and methane. While a number of modeling efforts have attempted to quantify this feedback, the future Arctic carbon balance remains unknown due in part to uncertain controls governing soil carbon decomposition. In this talk, Lydia will discuss a selection from her dissertation that addresses an important source of this uncertainty: how the temperature sensitivity of decomposition varies across soil carbon pools. Using a novel analytical method, Lydia evaluates soil carbon age and decomposability, and compares temperature sensitivities of fast-cycling and slow-cycling soil carbon pools. With implications for models and future field research, this study’s findings link controls on carbon cycling rates to long-term soil carbon dynamics. Lydia Smith Vaughn is a postdoctoral researcher at UC Berkeley in the Integrative Biology Department. She received her M.S. (2012) and Ph.D. (2017) from the Energy and Resources Group at UC Berkeley. Lydia’s research is rooted in two coupled questions: how does climate influence terrestrial ecosystems and how do terrestrial ecosystems influence climate? 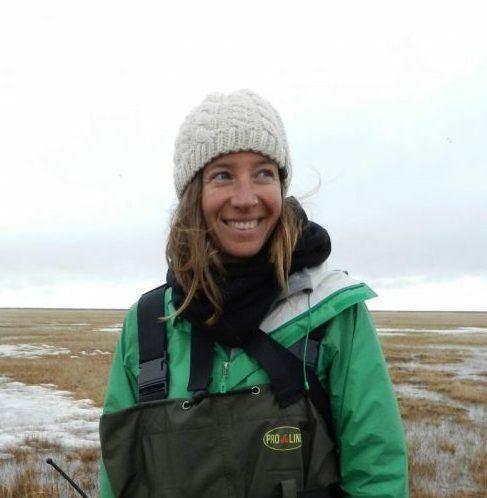 To investigate these questions, Lydia has worked extensively in Arctic Alaska, studying soil carbon turnover, its biogeochemical controls, and plant-soil interactions. Now closer to home, her current research is based in northern California’s Eel River watershed.